We have prepared various excursion maps that show model courses to help you appreciate the natural beauty of the San’in Kaigan Geopark. On these courses, you can learn about not only the landforms and geology of this area, but also the history, culture, and people’s lifestyles in this region. Why not enjoy the Geopark using these model course plans? 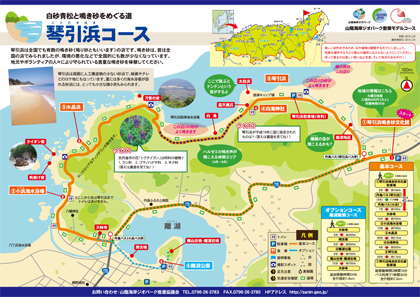 and Kachibe & Fudodaki Waterfall Course added! >>Click here for marine courses & driving courses! ※Downloads and print the map. It is recommended to print the map on both sides of a sheet of A3 paper and fold it in half. Downloads the latest version of Adobe Reader from the Adobe Systems website. ※Currently, there are several sites of landslides along the course. 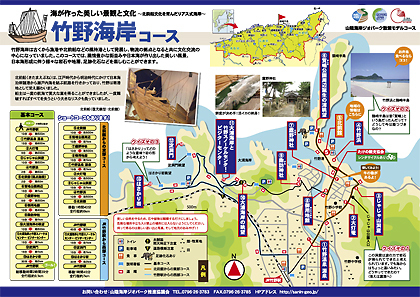 ■Tateiwa Rock Area Excursion Course　※Currently, there are several sites of landslides along the course. 【Contents】 On this course, you can learn about the history of Tateiwa rock and Tango including the legend of the eradication of oni (ogres), Takeno Shrine, and tumuli. 【Must-see spots】 Tateiwa Rock, Onaru Tumuli, Takeno Shrine, Shinmeiyama Tumulus, etc. 【Contents】 Course to visit Kotohikihama Beach, one of the most famous singing-sand beaches in Japan, and the sand dunes. 【Contents】 On this course, you can enjoy strolling in the Yuhigaura Beach Area, selected as one of “Japan’s 100 Spots for Beautiful Sunsets,” as well as learning about agriculture practiced at hot springs and on sand dunes. 【Contents】 On this course, you can climb Mt. Kabuto, a residual hill made of volcanic rocks located in the center of Kumihama Bay. From the top of Mt. Kabuto, you can enjoy a spectacular view of the Sea of Japan, and the unique landscape carved by the sea current. 【Must-see spots】 Mt. Kabuto Park, Mt. Kabuto Observatory, Hitokui Rock, etc. 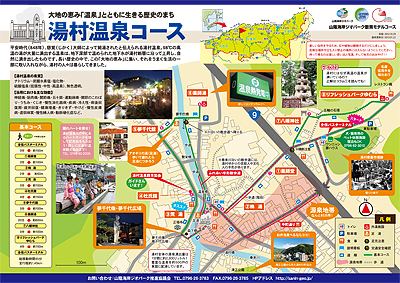 【Contents】 A historic hot spring town developed in the riverside district. 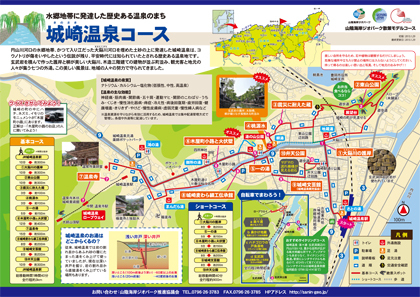 【Contents】 On this course, you can enjoy the beautiful townscape of a hot spring town developed in the district at the mouth of the Maruyama River. You can also learn how the town was rebuilt following its destruction by an earthquake. 【Must-see spots】 Higashiyama Park, the bank protection of the River Otani, Kiyamachi Koji, Hibuse-kabe Walls, etc. 【Contents】 Takeno developed as a port where Kitamae ships wait for favorable winds. On this course, you can enjoy the atmospheric townscape of the old port town of Takeno, the natural landscape created by the Sea of Japan, and the sheer variety of rocks and strata created when the Sea of Japan was formed. 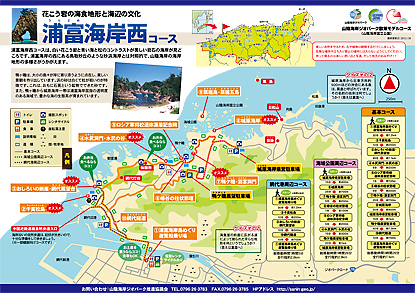 【Must-see spots】 Takenohama Beach, Kitamaekan, Takano Shrine, Takeno Snorkeling Center, Visitors’ Center, Hasakari Rock, etc. 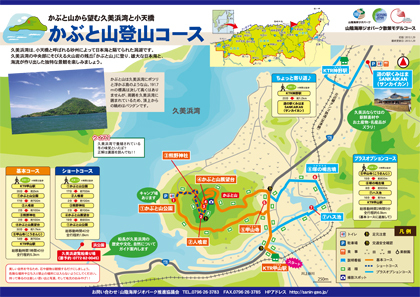 【Contents】 There are six volcanoes in the Kannabe Heights: Nishiki Volcano, Otsukue Volcano, Kannabe Volcano, Tada Volcano, Buri Volcano, and Kiyotaki volcano. Among these, Kannabe Volcano has a particularly beautiful crater at the summit. The lava that flowed down along the Inanba River created a beautiful landscape featuring many waterfalls. 【Contents】 On this course, you can enjoy a view of a fishing port in Kasumi where a variety of seafood caught in the Sea of Japan is landed, and a townscape reminiscent of olden Japan. You can also enjoy a spectacular, natural landscape created by the Sea of Japan, including the rock called Kaeru-jima (meaning “Frog Island”) in Imagoura that resembles a crouching frog. 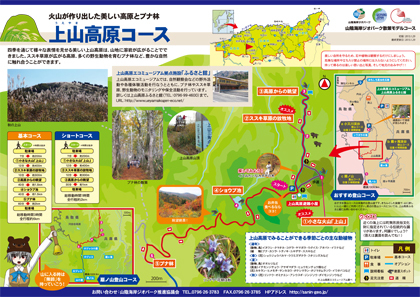 【Contents】 On this course, you can enjoy a beautiful landscape of mountains, valleys and waterfalls. You can also learn about the lifestyle of people living in the mountainous area. 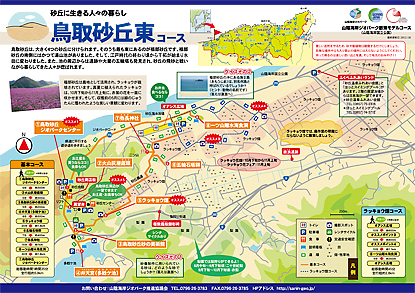 【Contents】 Hamasaka and Moroyose are towns located along the coastline. From the olden days, they developed as ports for Kitamae ships and towns where merchants gathered. Many famous writers and artists were born in these two towns. From the top of Shiroyama Enchi, you can enjoy a great view of Moroyose Port lapped by gentle waves. The view is reminiscent of olden Japan, when Kitamae ships called at the port and landed sailing compasses and other products from various parts of the country. 【Contents】 On this course, you can enjoy the high-temperature hot spring water welling up along fractures and learn about the people’s lifestyle making use of the hot spring water. 【Contents】 On this course, you can enjoy the beautiful landscape created by volcanos such as heights covered with lava and the small volcano “Ueyama.” You can also learn about the lives of animals living in the pampas grass field or in the beech forest. 【Contents】 On this course, you can enjoy the contrast between the beautiful rocky coast and the sandy beach, the laurel forest and the black pine forest (caused by the distribution of different types of soil). 【Contents】 On this course, you can enjoy the beautiful, rocky coast with a contrast between the white granite rocks, blue sea, and green pine leaves. 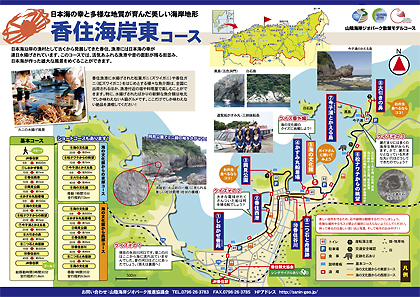 【Contents】 On this course, you can visit the Otani coast developed by rocks from Mt. Shichi and tumuli surrounding Mt. Shichi. You can learn how Mt. Shichi was formed and how the people lived in this area. 【Contents】 Scallion fields spread on the Fukube Sand Dunes and the sandy beach are adjacent to the rocky Iwato Coast. On this course, you can learn about the unique features of the coastline of the San’in Kaigan Geopark. 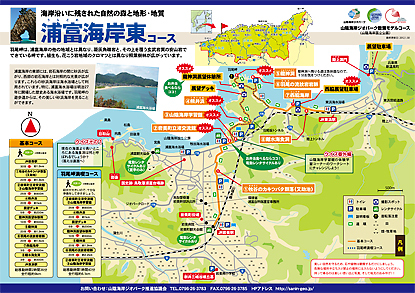 【Must-see spots】 Takigaiso Beach, the geological features of the Iwato Coast, and scallion fields, etc. 【Contents】 On this course, you can learn about how people live in this sandy land (e.g., the cultivation of Sand Dune Scallion) and enjoy the beautiful landscape. 【Contents】 On this course, you can learn about how the sand of the sand dunes moves and how the landform is created. You can also learn about how the sand dunes were created as well as the animals and plants of the sand dunes. 【Contents】 Lake Koyama has greatly changed in appearance over years. On this course, you can learn about how people have lived through tumuli and remains in the surrounding area. 【Must-see spots】 Aoshima Observatory, Fuse Tumulus, the remains of Fuse Tenjin Mountain Castle, etc. 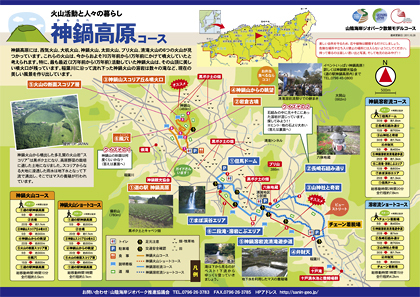 【Contents】 On this course, you can learn about the many legends handed down in the Mio Area while enjoying the beautiful natural landscape. 【Contents】 On this course, you can visit small fishing villages on the beautiful Rias coast. You can also enjoy the beautiful landscape of the coast. 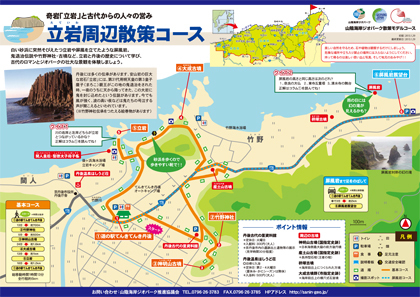 【Contents】 On this course, you can stroll in a historic castle town built on a plateau to experience how people used to live. 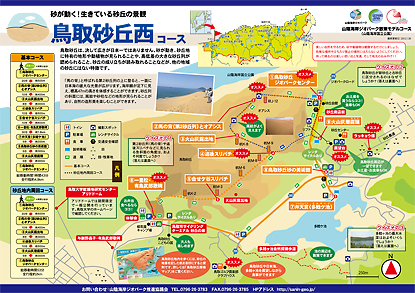 【Contents】 On this course, you can visit a sandy beach between capes with small sand dunes behind it. 【Contents】 On this course, you can visit a fishing port where ama divers used to dive to collect seafood until recently, and the cape with a complex coastline formed by lava flow. 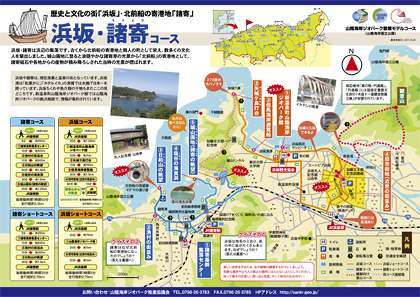 【Must-see spots】 Natsudomari Kaigan Coast, Natsudomari Shrine, the landscape of fishing villages, Aoya Kaigan Coast, etc. 【Contents】 On this course, you can visit various waterfalls, which have been revered as sacred places from the olden days. These waterfalls are formed on the valley walls of the plateau formed with lava. 【Must-see spots】 Fudo-daki Falls, Yubara-daki Falls, Myoen-daki Falls, Komori Shrine, etc.